Welcome to Long Camp in Chatham! Pet Friendly! 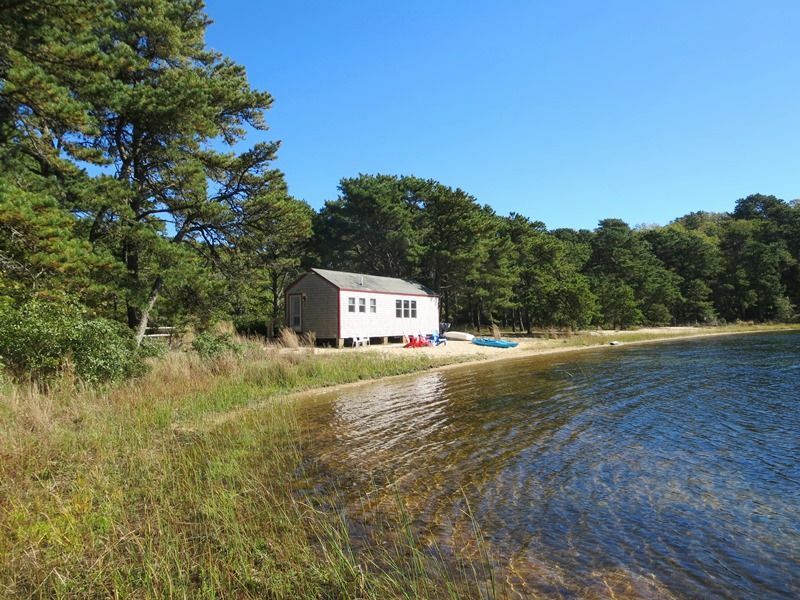 Come and enjoy a cozy vacation rental cottage on Goose Pond in Chatham. Goose Pond is the largest pond in Chatham and has 38 acres of unspoiled fresh water that is perfect for swimming, canoeing and kayaking. Free Wifi too. ​​​​​​​Nestled on the sandy beach- This cottage has been updated with new paint, new kitchen and bath and even comes with 2 kayaks. There is a Queen bed in the main living area along with 2 twins in the bedroom. There is a large dining table and comfy couch plus a flat screen TV will be on the wall for your enjoyment. Freshwater ponds are great for swimming, canoeing, and kayaking. Have some fun in the sun- Enjoy the adventure on the Pond or just sit back and relax on the sandy shore. The cottage sleeps 4 and is perfect for those that seek the serenity of the pond while still being close to Chatham for restaurants, shopping and ocean beaches. This home has Direct TV for your television enjoyment and was recently upgraded to include a Wifi Internet connection. NOTE: at certain times of the year- specifically May-early July higher water levels may occur in the pond (due to a lot of snow or rain in the winter months) and therefore changes the landscape of the beach area. Please look at pictures provided carefully-at certain times the water can be a foot from the cottage- Kayaks and chairs will be pulled back on the beach area for you to enjoy- again - please see photos. While this home does not have a washer/dryer---there is a Laundromat nearby at Chatham Laundromat at 768 Main Street Chatham (508-945-6200) that even has a wash and fold service for your convenience. No Smoking Please! Max parking of cars at property: 2. No parking on lawn anytime. This home allows 1 dog. A Pet Registration form must be completed upon reservation confirmation. This home has Keyless Entry with a 3pm Check-In/10am Check-Out. 2.4 Miles to Pisces Restaurant (Be sure to make a reservation!) and The Talkative Pig (pizzas and creative locally sourced dishes). 3.6 Miles to Chatham Bars Inn (Offering fine dining and full service spa open to the public). bordering the damp edge of Goose Pond. blurring and deepening in the shallows. the sunny side dry, the shady still wet. How many times did the lab look back? How many times have we? Well said - so poetic! Thank you for sharing such a nice tribute. We look forward to having you back! Perfect for us ! Thank You ! Thanks for the 5 star review! We did rent the cottage all summer and this is the first we have heard of a complaint on the mattress but we will let the owner know. We are so glad you enjoyed your stay!